An old favorite. Personally, I like them fresh, but pan fried after a day isn't so bad either. And it's not dumpling making unless you make the dough yourself! Buying wonton skins from the store is cheating. I've determined a good metric. 1 cup of flour will form approximately 10 dumplings, so make your dough accordingly. I prefer using the healthier ground turkey to ground pork. Add water, form into dough. For the filling, add all ingredients together. Beat 2 eggs, and add to filling. Let dough rest ~ 4-6 hours. Form dough into ~ 1" diameter rounds. Roll out. Add filling to middle, wrap together and pleat. Add to boiling water. When the water is about to boil over, add in cold water. Repeat 2x more times. 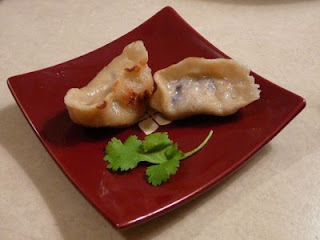 Enjoy with jiao zi dipping sauce (sesame oil, soy sauce, brown sugar, green onions, minced garlic, minced ginger, salt, pepper). Here's the dough after forming and kneading. An intermediate stage of forming, where the rounds are shown in the background. A closeup on the pleating. Mine are ok looking- my dad's pleating is much better looking, and he can do them one-handed! What they look like when pan-fried.